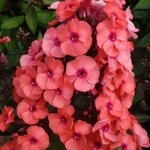 Phlox paniculata 'Younique Orange'. A rare color in Phlox hybrids, the glowing salmon-orange blooms on these compact plants offer amazing color to the garden and great for cut flower arrangements. Afternoon shade is recommended for best display of flower color. PPAF.